New Sports Commisioner – footsteps……..
SPORTS Advisory Panel (SAP) chairman Datuk Nik Mahmood Nik Yusof will take over from Tan Sri Elyas Omar as the new Sports Commissioner. Elyas, who became the first Sports Commissioner on a full-time basis in 2005, had asked for a three-month extension which ends on Monday. Sports Minister Datuk Ismail Sabri Yaakob said Nik Mahmood’s name hasbeen submitted to the government for approval and expects him to startas soon as possible. 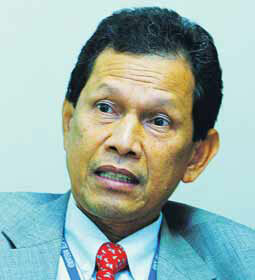 “Tan Sri Elyas’ tenure comes to an end on Monday and he felt that he has done his part as the Sports Commisioner. More HERE.